I spent a great couple of hours with Mike Dulak of Big Muddy Mandolins. 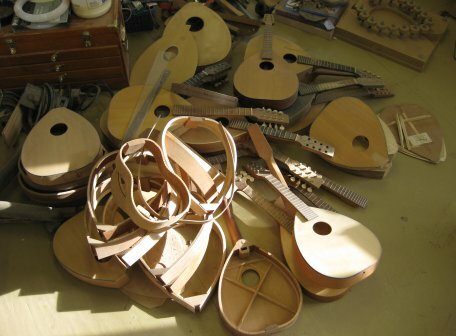 Mike’s been making instruments for years, and is the largest industry in Rocheport. I caught him in the middle of moving his shop, so things were a little chaotic. The above pile of part-finished, discarded or otherwise parts summed up the state of the workshop as I saw it. And yes, that is a uke body. Mike’s really refined his workflow. He’s built a nifty broach to cut all the string slots in a nut in one swipe. He has a fretting jig that cuts all the slots in one pass (hey, mandolin fretboards are quite short). But to make up for that, he shapes heel necks by hand using a rasp and sandpaper. I’m really glad I visited, and makes my mandolin a little bit more special to know who made it, and see where it was made. It’s a Big Muddy flat top mandolin, hand made in Missouri with a lovely Adirondack spruce top. 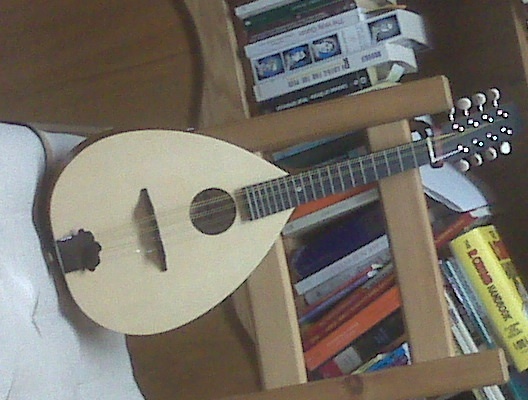 I really like the portability of the mandolin. I didn’t think I’d like the tiny scale (hey, its entire fretboard is only as long as 6 of my banjo frets), but it’s pretty comfortable. Way more so than a ukulele. Dave Raine said he’d take us to dinner at a fishing store. Woo, we thought; hot dogs and soda while he dug for bait. Ths isn’t the case when the fishing shop is the HQ of Bass Pro Shops in Springfield, MO. They have a fantastic restaurant, complete with cordon bleu chef. Who knew? I’ve just finished reading Jesse James: Last Rebel of the Civil War, by T. J. Stiles. A fascinating book, it describes the Missouri/Kansas border of the 1860s-1870s with the same level of horror as 1990s Kosova/Kosovo. I know the area well. Catherine grew up in Liberty, and her mother still lives on Franklin Street, the site of the 1866 raid on the Clay County Savings Association by a gang including Arch Clement and the James brothers. The James family made their home in Kearney, the town which used to have my favourite diner, Clem’s Café. After the civil war, veterans returned home with their weapons, and used them to settle old scores. Stiles makes the point that carrying handguns was rare before the war, so this is a possible root of the US’s gun crime problem. But what struck me most was the amazing names that cropped up in the book: Adelbart Ames, Delos T. Bligh, Schuyler Colfax, Alvis Dagley, W. L. Earthman, Aber Gilstrap, Odon Guitar, Nimrod L. Long, Zerelda Mimms, Sidney G. Sandusky (who, coincidentally, built the house in Liberty that Catherine grew up in), Theodrick Snuffer, Flourney Yancey, and my favourite, Greenup Bird. You just don’t get names like that any more. These are solid names, they’ll see a lifetime through. arrived in Liberty on the 24th, then immediately went to Catherine’s grandmother’s house in Lee’s Summit for Christmas dinner. If I can fix a turkey dinner with Parker House Rolls and all the trimmings when I’m 92, I’ll be doing pretty well. took the train from Independence to Kirkwood to visit Joe & Katie, Catherine’s brother and sister-in-law. stayed in ye olde cheesye Cheshire Inn in St Louis, which is a hilariously fakey (but pretty good) “old” hotel. took Amtrak back to Independence. did the necessary shopping rounds in Liberty: LaMar’s Donuts, clothes shopping at Feldman’s Farm & Home (aka The Feed Store), and browsing books at By The Book on the square. had lunch at the incomparable Englewood Café in Independence. 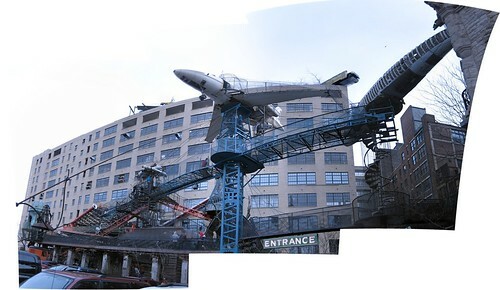 went to see Carlyle’s art exhibit downtown, which turned more into performance art, as the gallery was closed. hung out with Catherine’s high-school friends in Westport, and had the importance (and usefulness) of dry “bible highlighters” explained to me by Carl. Then we ate at the Jerusalem Café. … and now we’re home.